If you are taking a similar approach to art instruction as I am – that is, going it alone, for the most part – you’re going to need a well-defined plan. This is where I leave it up to you to decide what works best for your particular situation. As for myself, I’ve come up with some in-roads to figurative skill development that I feel will be quite helpful for what I hope to accomplish. The Charles Bargue Drawing Course has caught my attention quite a bit as I have read about it’s basic concept, not to mention that it was authored in-part by one of my art-history heroes – Jean-Leon Gerome. It is precisely this attention to detail that gets my blood flowing and my excitement level up a few notches. 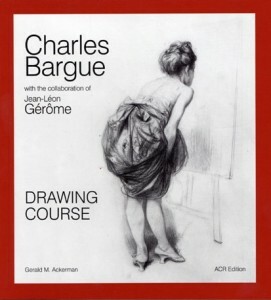 If you’re not familiar with the Bargue Course, it was developed by Charles Bargue & Jean-Leon Gerome and published in Paris in the 1860’s and 1870’s. It is a collection of about 200 lithographs – copies of classical sculptures, master drawings, and figure studies – that are designed to be copied by students in order to prepare them for life-drawing. The idea is to help the art student understand the way an artist sees his subject and breaks down the three-dimensional figure into a two-dimensional illusion of that figure. Also, the use of classical sculpture as a major subject of the lithographic plates was meant to help the student understand good aesthetic taste, as was the fashion of Classical Realism. The course was hard to find (and still is, if you don’t have internet service), but was recently published by ACR Edition Internationale, Paris, authored by Gerald M. Ackerman with the collaboration of Graydon Parrish, and sponsored by the Dahesh Museum of Art in New York City. This book is a real gem – beautifully bound and presented, with a great deal of extra material inside to guide anyone interested in taking the course. If you do a web search of “Bargue” you’ll be surprised at how many new results keep popping up. There seems to be a growing trend in the arts to return to the fundamentals of Classical Realism, and the Bargue Course is again becoming quite popular. This is great news for those of us who have been yearning for a revival of realism. Regardless of the original intentions of the Bargue course (to be a precursor to working from life), I’ve found that dipping my hand in a few different resources at once gives me the greater benefit overall when I’m learning something new. That being said, I plan on working through the Bargue course continually and steadily, but also exploring other avenues of artistic development at the same time. Sketchbooks, life-classes, cast drawings (although, I’ll probably do a lot of Bargue plates before I jump into a true cast drawing) – all are useful methods of improving my skills. Well, that’s enough talk. Now it’s time to get busy drawing!